New titles arrive in board book editions just right for small hands. 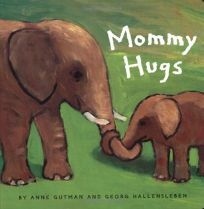 Mommy Hugs and Daddy Kisses, by Anne Gutman and Georg Hallensleben (the team behind the Gaspard and Lisa books), demonstrate the affection between parents and their offspring with a variety of snuggling animals in simple, impressionistic paintings. In Hugs, ""Mommy polar bear hugs her cub with a tickle""; in Kisses, ""Daddy giraffe gives his calf a kiss on the neck,"" while ""Daddy frog gives his froglet a kiss on the eyes.""